Home→Animals→dogs→Can You Wear the Bottoms of Your Trousers Rolled When You Don’t Wear Trousers? Can You Wear the Bottoms of Your Trousers Rolled When You Don’t Wear Trousers? 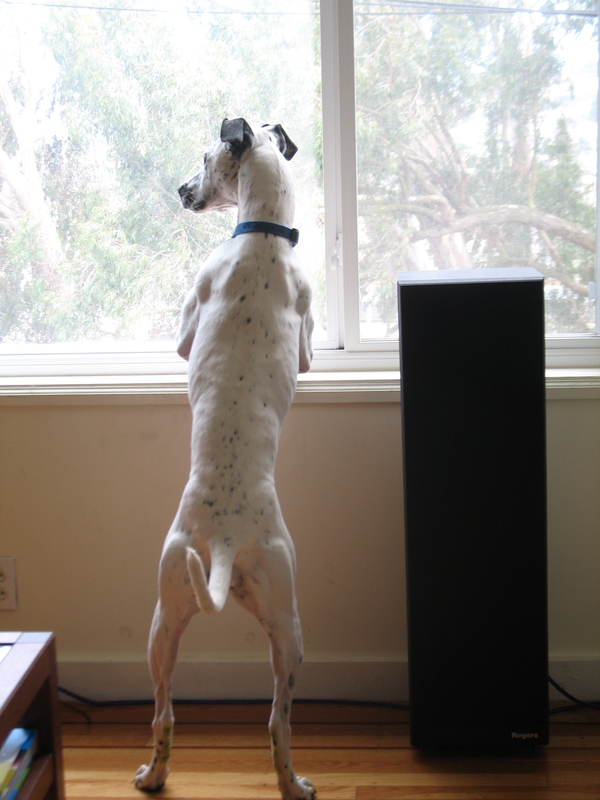 This photo was taken when Emily, the household dog, was a spry young animal of four or five: she is vigilantly looking out on our street, watching for skateboarders or other dogs. Skateboarders are her particular abhorrence. These days Em doesn’t stand in the window surveilling. Her hearing is not so great, her eyesight’s iffy, and more than that, her knees are in bad shape. When she was about six she tore the right ACL and required surgery (and six weeks of tranquilizers so she would hold still and heal), and her athletic prowess diminished significantly. She had been able to leap six feet in the air to catch a ball–now she was down to about four feet. Didn’t mean she stopped jumping: this dog craves activity and loves catch and other eye-snout-coordination games.And she would guard the block by standing, alert, in the front window, keeping the household safe from men in hats (another of her unreasoning prejudices) and skateboards and bicycles and loud music and other dogs. She favored her right knee a little, but was determined to be the high-energy I’m-Secretly-a-Puppy dog she had always been. And ridiculous. Did I mention ridiculous? Emily just turned 13, which is a great age for a mid-size dog. And in her own mind she is still a puppy: when I’m walking her and she meets a strange human, she expects, as her divine right, pats and admiration and scratches and worship, and she gets them. When she meets a friendly dog she goes straight to play-bow-and-let’s-play mode. This is all the more striking because her stalwart left rear knee, which bore the brunt of her athleticism post-surgery, is now giving her problems, and those bouncy Wanna Play bows must hurt. But the heart, and the instincts, want what they want, and Emily wants to play. 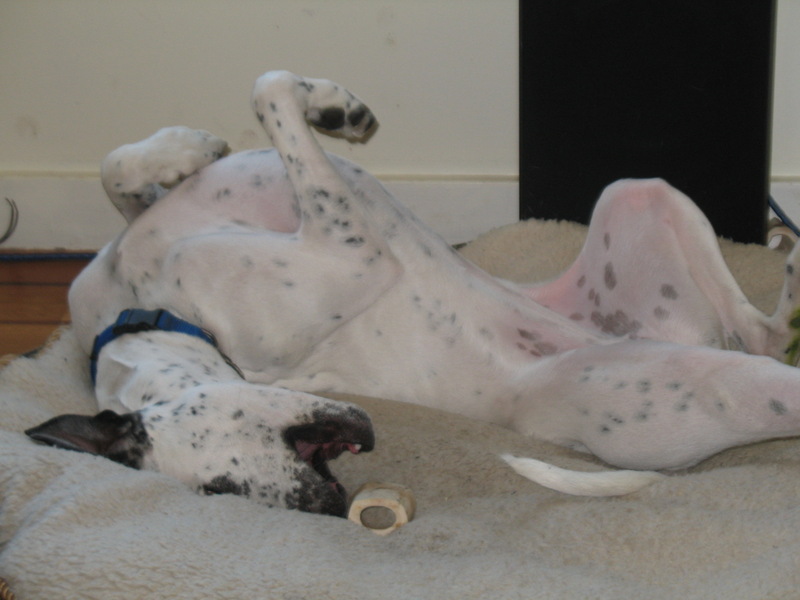 But when she gets home and curls up on one of her beds, she often moans softly–a soft moan, amplified along her long nose, sounds like the cry of a distant loon–and strives to find a position that is less troublesome to her aching joints. When she gets up from her bed it is often with more moans, and maybe one of her feet going out from under her (we have hardwood floors, and if she loses traction it’s hard to get it back). Her body language says, loudly, “what, what do you want from me? I’m old. Everything hurts. Oy, my life.” And then she espies her current semi-disemboweled toy, and grabs it and presents it to me with the attitude of “Hello, excuse me, there’s a dog and you’re letting down the side by not playing with her non-stop.” So tug-of-war ensues until she is sated. Satiation arrives earlier these days for her and for me. We’re both getting older. My knees are no great shakes either. But often during the day, as I go about my life, I remember fleetingly that the end of Emily’s time with us is on the horizon. I’ve never actually been around for the end of life of a pet: my first dog was given away when my mother decided that two kids and a puppy was one more life than she could handle at that time, and my free-range second dog disappeared while I was at college (I like to think he ended up riding shotgun for a long-haul trucker; he would have liked that, and please don’t disillusion me on this point because losing him was hard enough). But I expect to be around when Emily goes to the Dog Spa in the Sky, and I am dreading it a little. Or a lot. You take a life into yours and these are the risks. I would not trade having her in our lives for the alleviation of future grief, but I don’t have to welcome that grief even a minute earlier than it naturally arrives. What a darling, so bright, looking out that window. She sounds adorable. Speaking as a longtime dog lover, yeah, it’s going to hurt, but it won’t as much if you can be there for her when the time comes, and reflect on the good life you gave her. As someone who still misses the cat who’s now been gone for way more years than he lived, I understand this all to well. Oh, hell, I still miss my childhood horse, who died in her 20s after I was grown and not living at home. My Gaby is 12 (give or take given she was a rescue). That equals anywhere from 60-69 in human years, depending on the calculator. She’s an outdoor dog for all she looks like a floof, Still chases squirrels, but has reached the point where sometimes I can lure her away with a cookie. Other times, she watches the squirrels from a distance, half-asleep, preferring to keep her powder dry for another day. She’s the smallest dog I’ve ever had at 38 pounds, and with luck I will have her for a few more years. But I’ve had to make the decision twice in the last 11 years, and so I try not to think about it now. I don’t always succeed. I wish my Captain Jack (9) could get together with your Emily. I have a feeling they’d hit it off. A year ago, he was in the enforced-quiet recovery period following his own torn ACL surgery. He loved going to PT, and the hydro-treadmill.